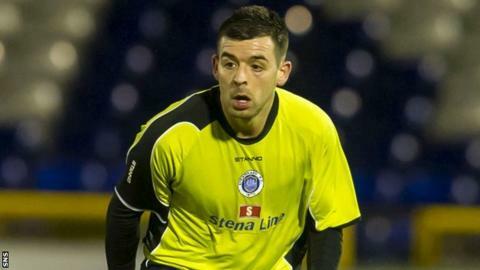 Steven Bell shook off a pre-match knock to deliver a late blow to his former club's promotion hopes as Stranraer edged out Dunfermline Athletic. The Blues went ahead in the 12th minute, Martin Grehan converting Jamie Longworth's centre from close range. Faissal El Bakhtaoui finished high into the centre of goal four minutes before the break to equalise. The Pars were reduced to 10 men when Jonathan Page was shown a red card before Bell won the first-leg play-off. It completed a disastrous final eight minutes, with Page picking two yellow cards within two minutes then Bell got on the end of Andrew Stirling's free-kick. However, it was a deserved win for a Stranraer side who dominated the match and made it two wins in a row against the side who finished above them in second place in League One. The Pars had gone into the game having held champions Rangers to a 1-1 draw with a young side. Their more experienced line-up was unable to extend their unbeaten run to five games and they must record a fourth win of the season over Stranraer when they meet again on Saturday if they are to reach the play-off final. Stranraer: Mitchell, Robertson, Rumsby, MacGregor, Docherty, Winter (Borris 78), Gallagher, Bell (Stephen Stirling 90), Andrew Stirling, Grehan (McKenna 61), Longworth. Subs Not Used: Fahey,Kinnaird,Forde. Booked: Gallagher, Bell, Stephen Stirling. Goals: Grehan 12, Bell 88. Dunfermline: Scully, Millen, Page, Morris, Grainger, Falkingham (Husband 70), Geggan (Forbes 42), Byrne, Spence, El Bakhtaoui, Thomson (Martin 86). Subs Not Used: Williamson, Goodfellow, Whittle, Smith. Sent Off: Page (84). Booked: Falkingham, Page.